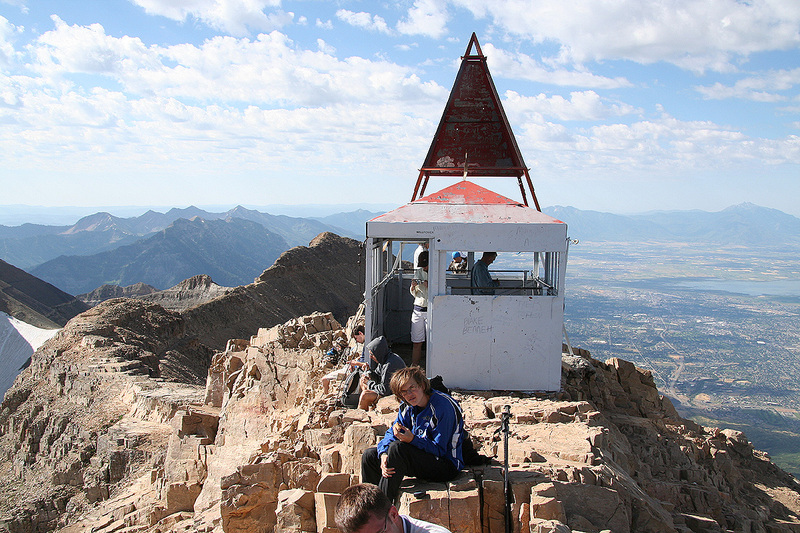 How to get there: Salt Lake City is the natural point of refeence. 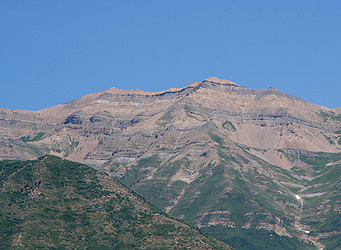 This mountain is very popular and serves as the main, major hiking goal for many people living in Salt Lake City as well as in the many communities near Utah Lake south of Salt Lake. From Interstate I-15, use exit 272 and go east along Hwy. 52 (also called 800 North). This road ends in a junction with Hwy. 189, go left here, the sign says 189 North. Continue approximately 7 miles along Hwy. 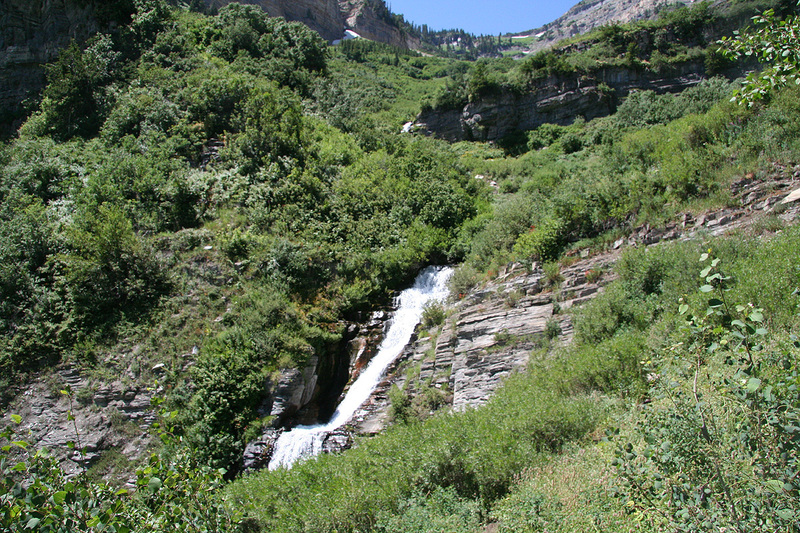 189, the road is called Provo Canyon Road. The key landmark is to notice when you drive through a short tunnel. Immediately after this tunnel, make a left turn onto Hwy. 92. Continue up the valley along this road for about 6 miles. You will pass the Sundance Resort (on your left), then arrive at a toll booth. Most likely, this booth is unmanned and you will find a large parking area on your left and a self serve parking fee station. Pay for parking and park here. 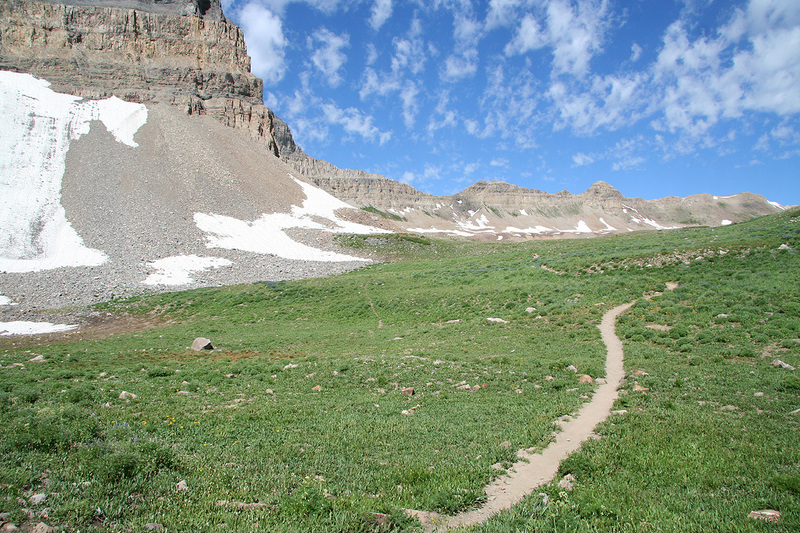 This is the trailhead, location N40:24.260, W111:36.305, elevation about 2090 meter. 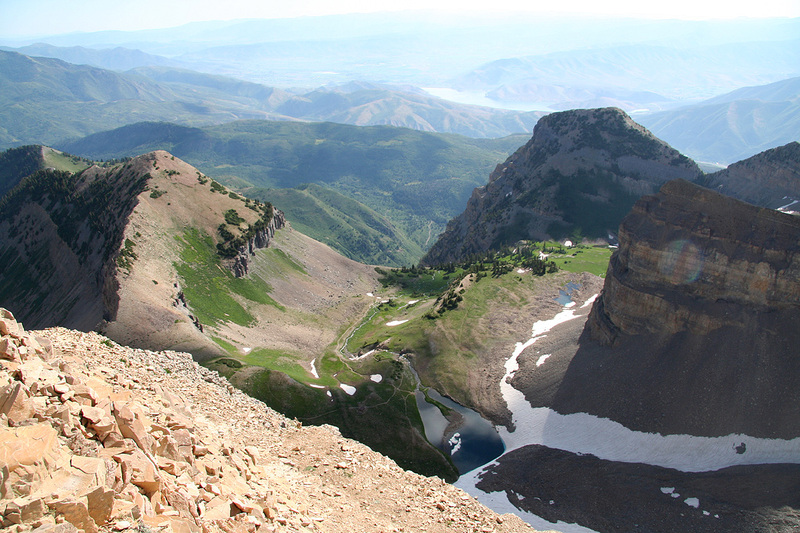 Route description: From the trailhead parking, head uphill along the wide, obvious trail that starts out on the right (upper) side as you enter the parking area. This trail starts out as a wide dirt path, then higher up you get to a slightly confusing sign telling that the trail continues straight as well as goes right. The intention is to indicate a foot bridge (going right) in case of (substantial) water in the creek ahead. In July, there was no water and proceeding straight ahead is the natural choice. From here, the trail is actually paved about 1.5 kilometer onwards. The trail first turns nearby a waterfall formed by the main creek coming down this valley, then climbs and visits the next waterfall formed higher up by the same creek. At this point the paved surface of the trail ends and a more normal trail will take you higher. This trail starts out with some rather very long switch-back turns on the slope above. The elevation gain is rather moderate. A very long traverse right followed by an even longer traverse back left will bring you into the upper part of the valley climb which is now more constrained by the rock formations. You will cross the same creek several more times, one of these crossings is again near a small waterfall where one actually may walk behind the water without getting wet. The trail now gains elevation in shorter turns and the horizon above quickly gets more within reach. The middle section up here has a somewhat confused trail, there are several variants, however, they all merge back into a single trail a bit higher up. The next section, when you have gained the obvious "horizon" while climbing the (steep) valley, is gentle as the trail first curves left and gives you a nice view of a small meadow and pond, then goes more right and ascends slightly more to gain the main lake just below a permanent snow field. At this point, the summit is straight ahead, you can see a summit structure on top of the very steep cliff that raises ahead. From here, there are two possible routes. 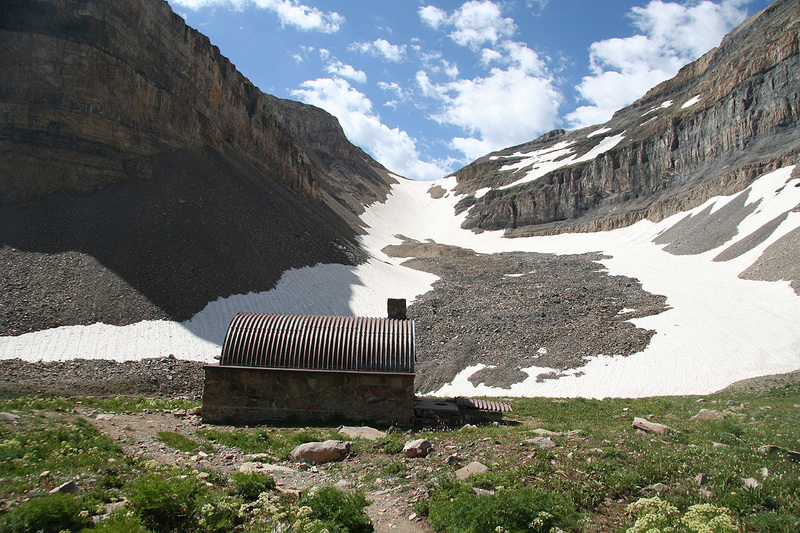 The trail bends right (do not cross the creek or any part of the lake), and passes a small hut having a curved (semi-circle) roof. 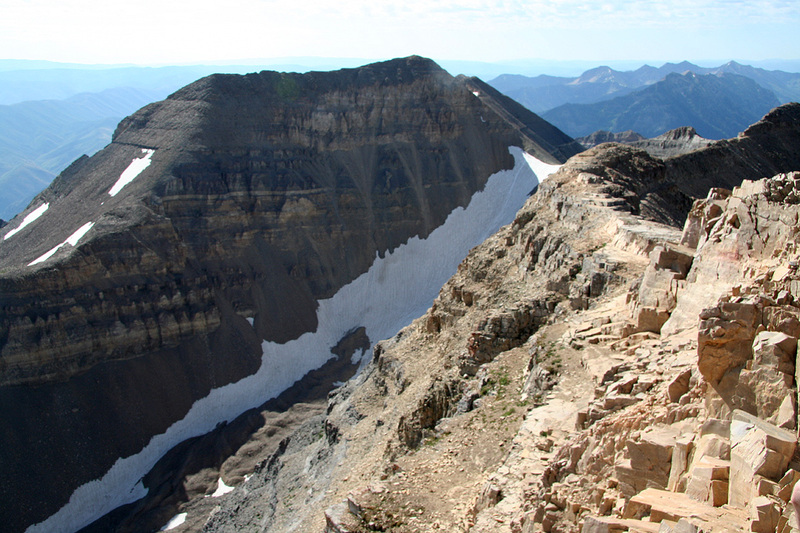 That is, the route shall take you right (north) of the steep cliffs that runs up to the summit. 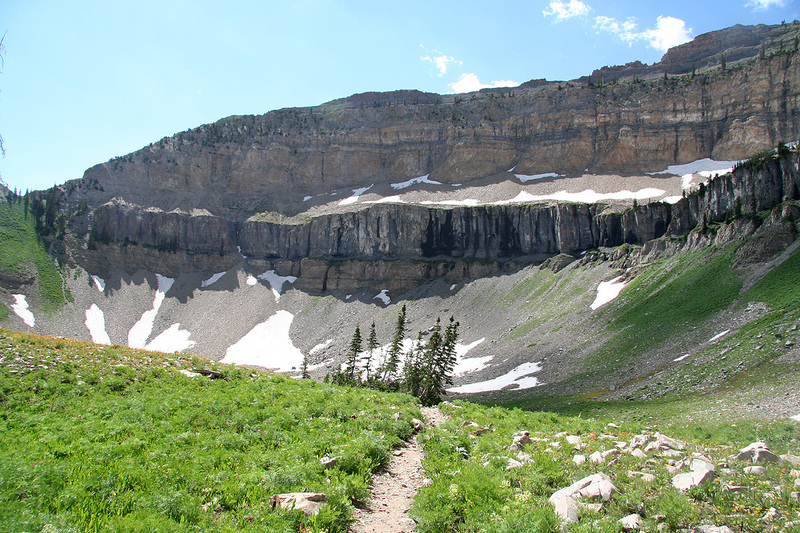 This trail traverses along a fairly distinct route where cliffs drop to a basin floor further down, while other cliffs form steeper terrain above you (on your left). The passage is not difficult as there is a nice trail. This trail hits semi-permanent snow on the other side, earlier in the season this snow may perhaps also extend to the traverse and then one should carry an ice axe (and crampons) here. The route continues its fairly horizontal traverse, then gradually climbs while still going right, in order to meet up with another main route to this summit, called the Timpooneke trail. 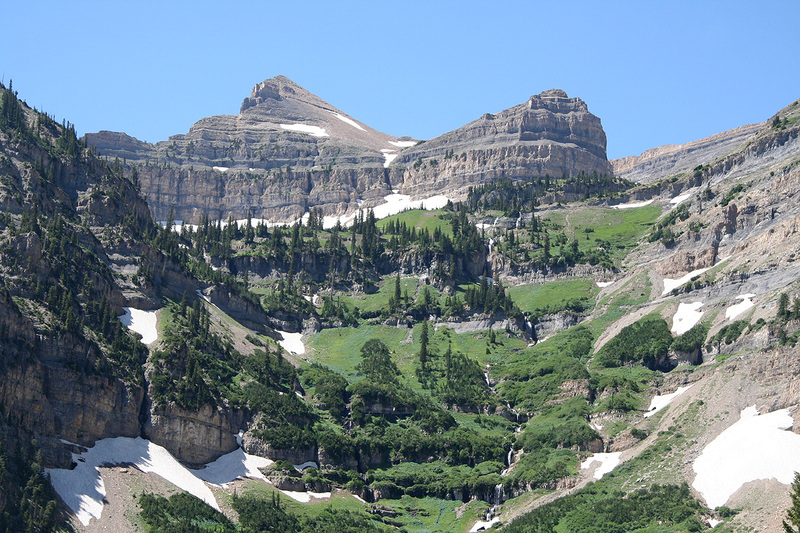 The two trails now climbs the final section to the summit, first a bit along its north ridge, then off (on the right or west side), zig-zags up a fairly steep gully (when there is still snow, this might pose a problem), then continues to gain the ridge and the summit. The alternative route branches off down by the lake. 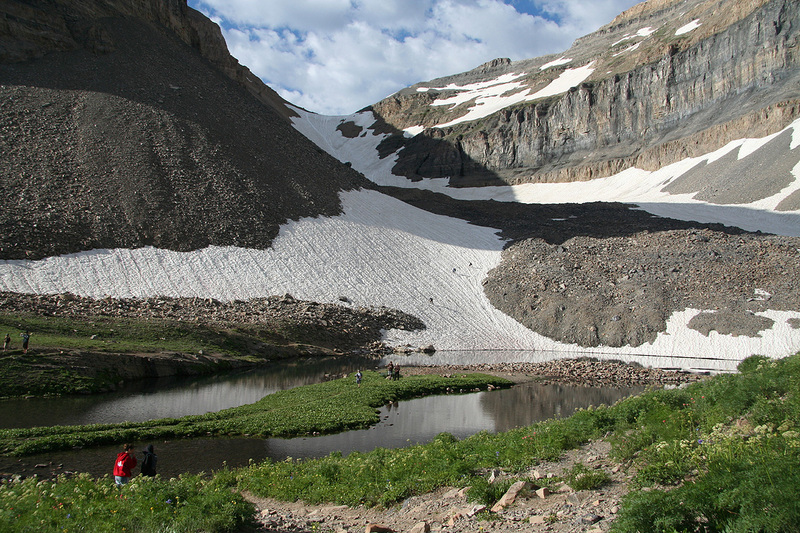 Across the lake, you will see a permanent snow field that extends up the valley to the left of the steep summit cliffs. The snow extends up to a pretty distinct col at the end of this small valley. 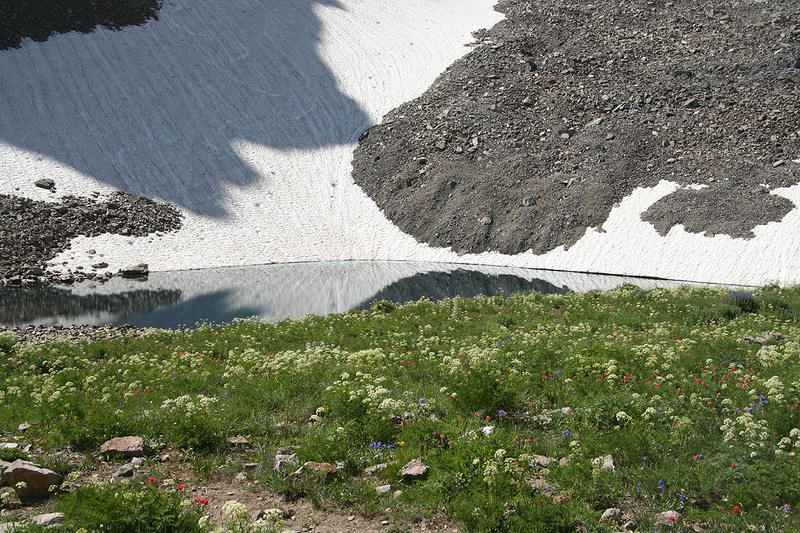 Proceed across the creek where the lake ends and hike the snow all the way to this col. 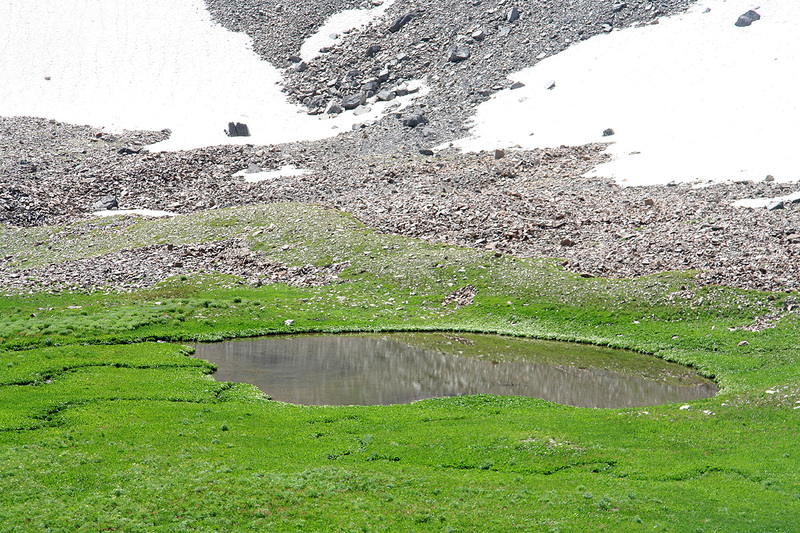 In summer, this snow may be quite hard and icy. The slope towards the end is moderate, but could still cause problems unless you have proper footwear. Good boots will normally suffice, crampons will make this route a trivial hike. 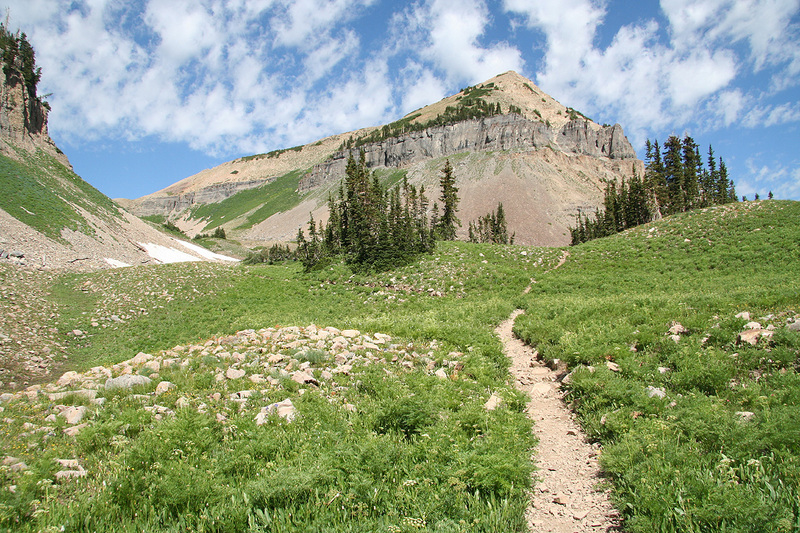 From the col, there is a small, but good trail that leads to the summit. This trail stays left of the main ridge most of the way. We made good progress and arrived at the small lake around 0830. From there, we took what looked like an obvious route, up the valley, up the snow field, then the ridge to the summit. This turned out to be an "incorrect", but possible route. 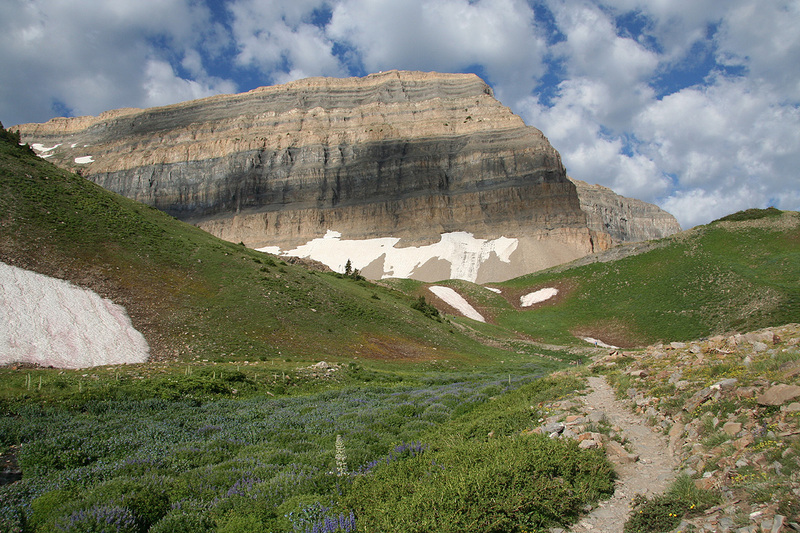 The correct route traverses to the right side (when viewed from below) of the summit cliffs. Actually, Pål Jørgen had extremely worn out (sort of falling apart) running shoes that turned out to be very slippery on the somewhat hard snow. Despite this, the snow was no big deal and we could have climbed up along the edge of the snow if forced to do so. 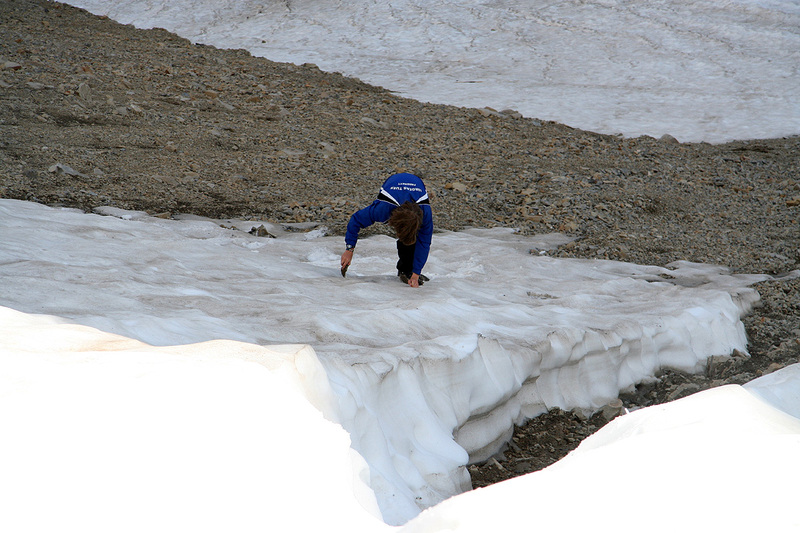 This snow is called a "glacier" by the locals, since it stays around from one winter to the next. 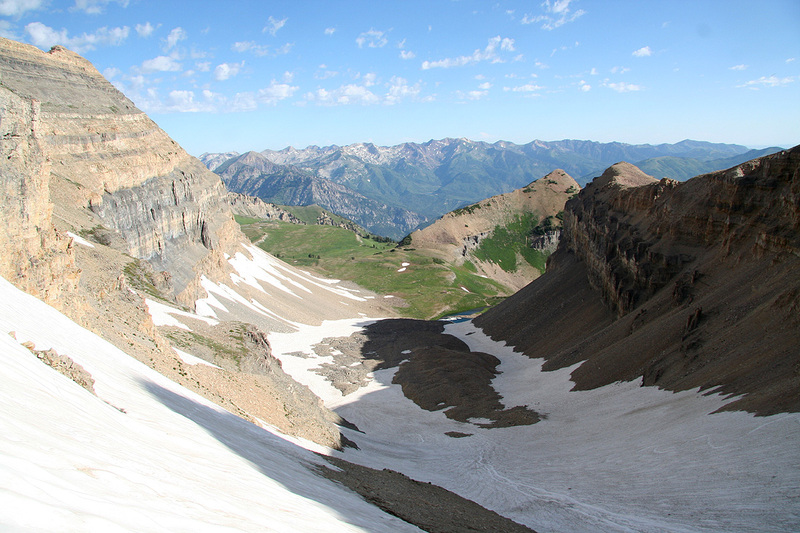 Obviously, it is not a glacier, but rather a fairly large, permanent snow field. From the col above this snow, a pretty obvious trail will lead upwards largely on the left side of the ridge line, and take you to the summit. 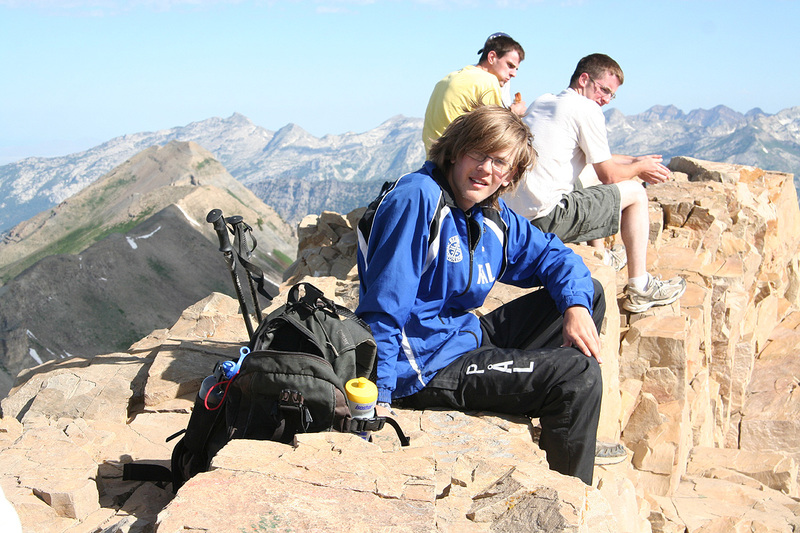 We arrived at the summit at 0935, 3:15 up is likely a bit faster than what one should plan for. There were about 5-6 more people at the summit when we arrived. 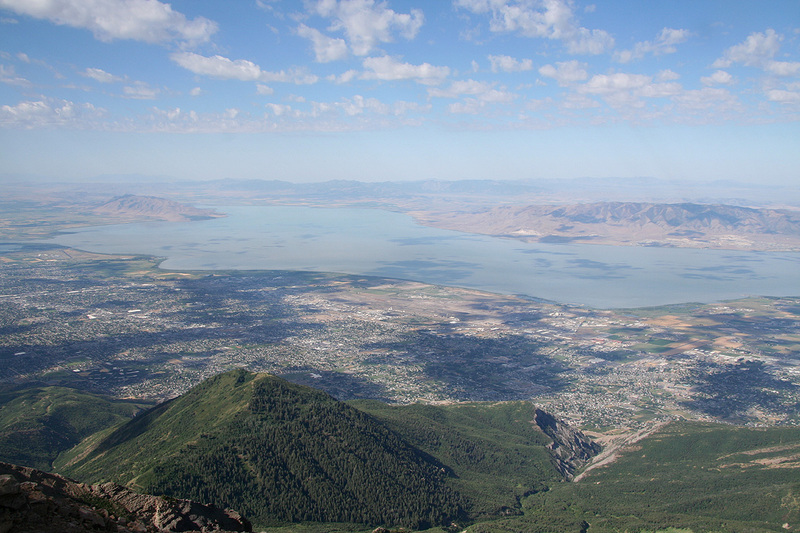 We talked to a man that could see back down to his house, it seems like this is not uncommon, the entire Utah valley and the Utah Lake was just directly to the west. He had been to Norway two years as a misionary, he came up the Timpooneke trail and it had only taken him a bit more than 2 hours, - extremely fast pace. We started back down after a very nice 30 minute break, this time along the official trail. 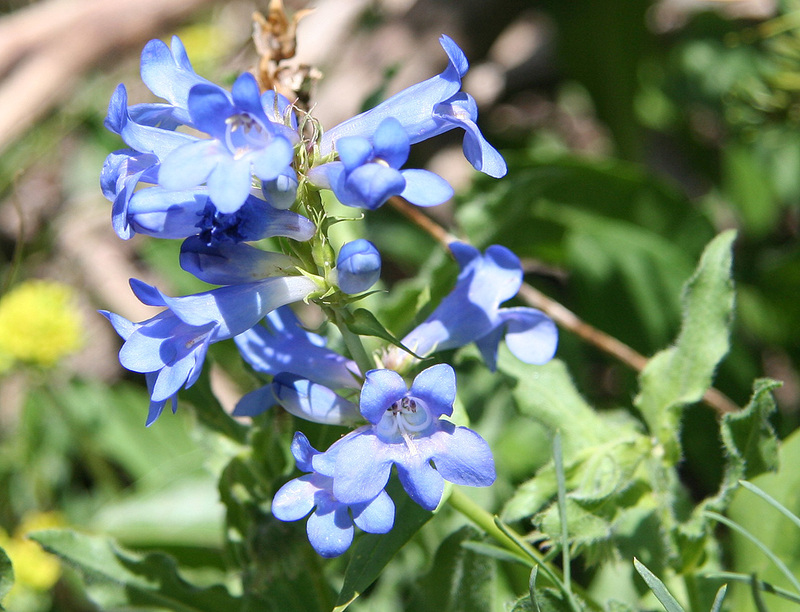 I made numerous stops in order to photograph the landscape, peaks and flowers. Towards the end, it got quite hot and I got tired. Hiking downhill on a paved trail was not exactly nice for my knees, dirt is much to be preferred. Still, I arrived back at the car by 1150 where Pål Jørgen waited with a cold coke, just what a thirsty dad needed right then. 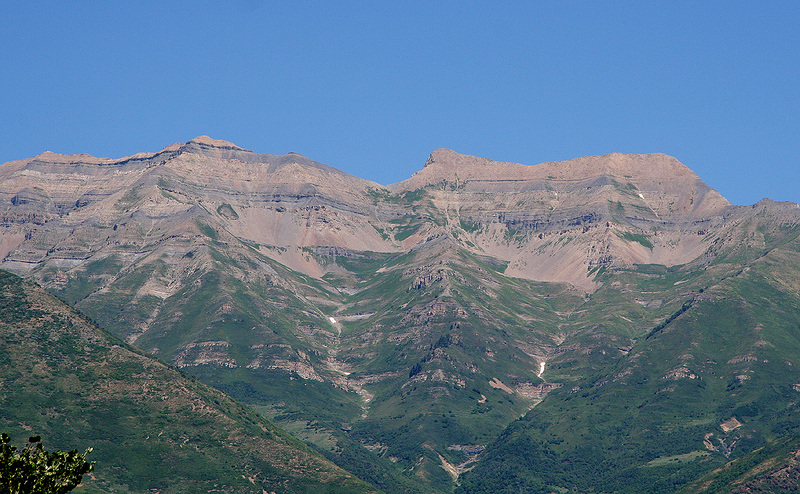 Mount Timpanogos, as seen from the city below. The highest summit is far left in this picture. 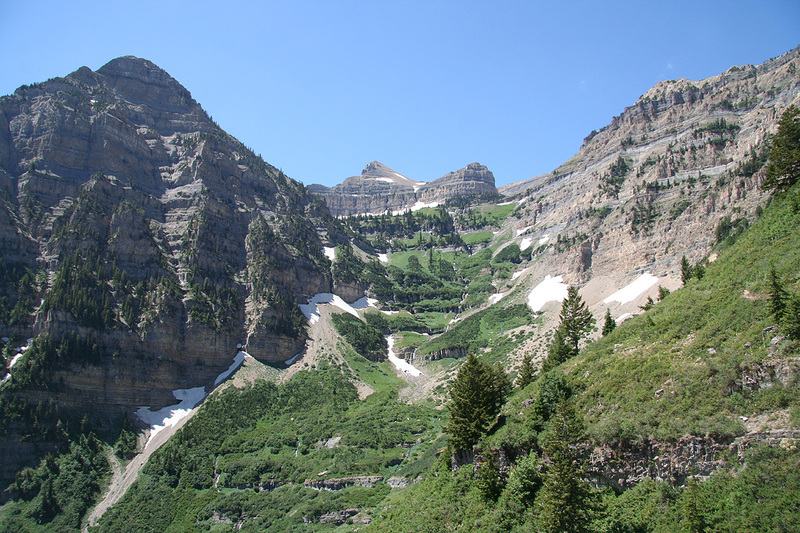 The route, runs up this valley along the creek, the summit is not visible, but part of the high ridge can be seen further right. The snow valley, as seen from the col. The snow field, as seen from the summit. Summit view to part of the route. The trail gains the area in the middle of the picture and proceeds to the small lake. The trail can be seen going left, while the snow alternative forks right (as seen in this picture). Summit Panorama III. 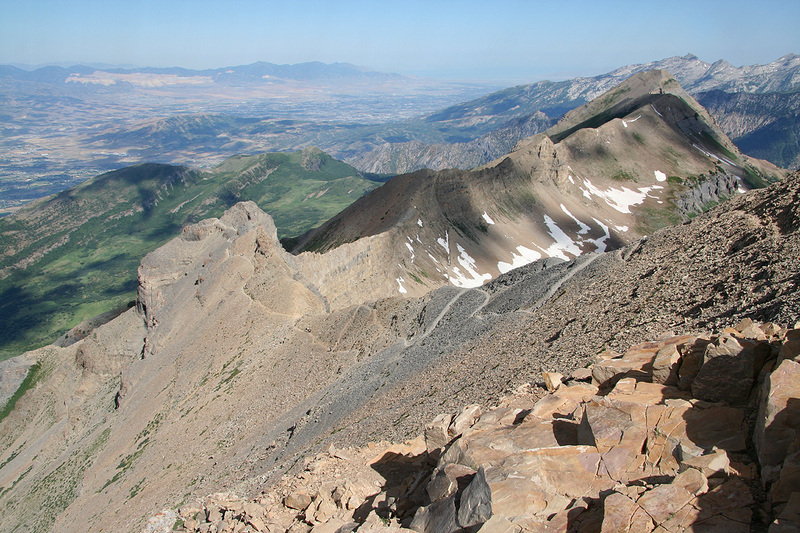 The view is north-west to north, Mineral Basin (Snowbird) and the mountains around can be seen to the far right. 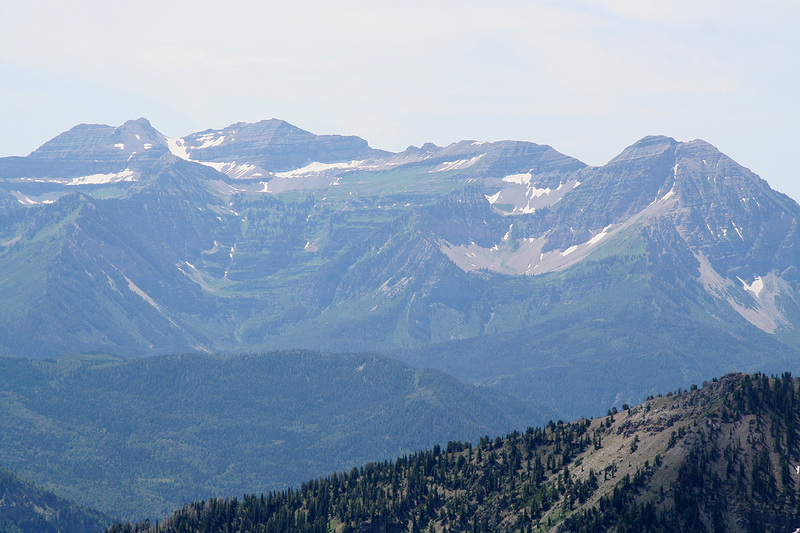 Mount Baldy and Sugarloaf Mountain are the two rightmost tops. 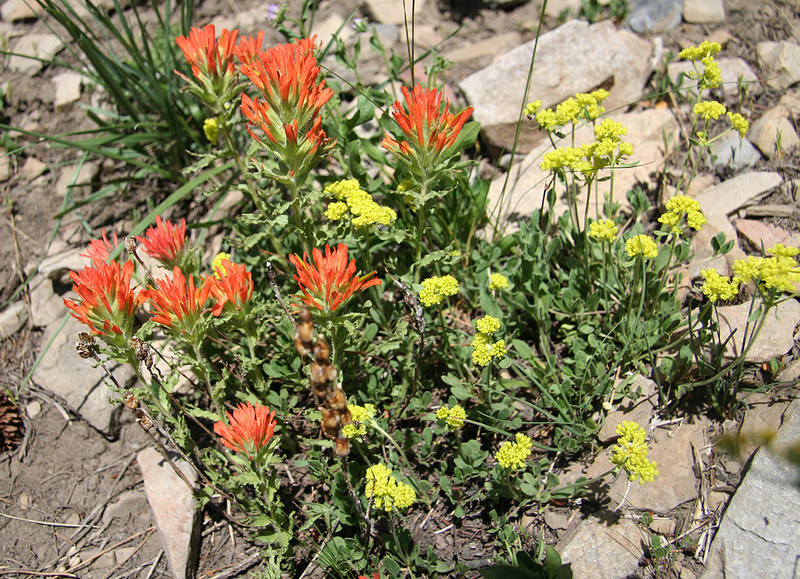 Flowers, high on Mount Timpanogos. 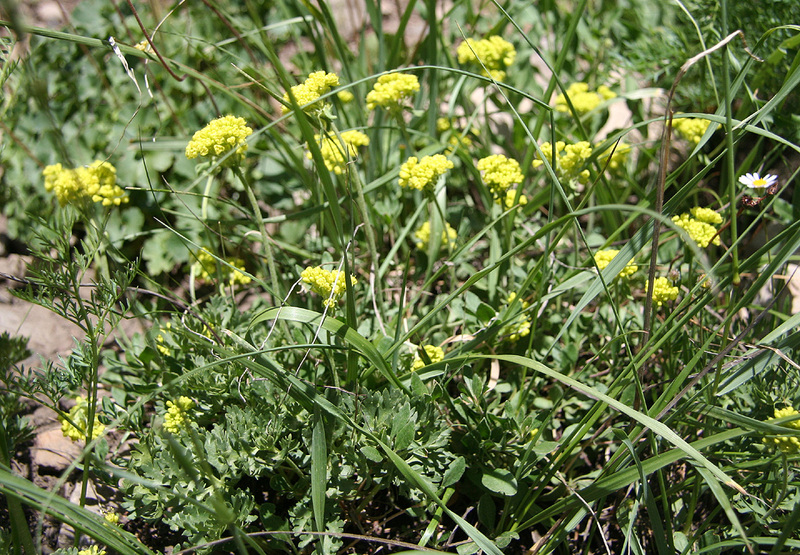 Yellow flowers, on Mount Timpanogos.